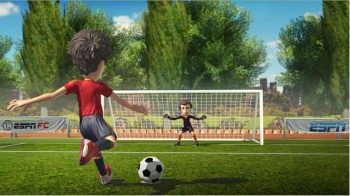 ESPN Sports Connection for the Wii U will have multiple types of sports, multiplayer, and plenty of ESPN branding. In addition to the eight games it already has on Nintendo's launch window list, Ubisoft is bringing one more title to the Wii U this holiday season. The publisher has teamed up with ESPN to create ESPN Sports Connection, which features soccer, football, baseball, tennis, golf, and go-karting, with a press release implying that even more will be available in the final game. ESPN Sports Connection, which is "ESPN's debut presence in the casual multi-sport gaming space," was described as "the next generation of multi-sports games" in the press release. It will utilize the Wii U's GamePad controller differently for each sport, allowing players to "control the blitz" in football or get a 360-degree view of each hole in golf. There will be single-player, co-op, and multiplayer modes, which will support up to five players (with one using the GamePad). And if you were worried about a lack of ESPN branding in your sports games, fret no more: "players will unlock original designs to create their own unique ESPN-branded gear as they progress through over 250 diverse in-game achievements. ESPN logos include ESPN, ESPNU, ESPN Classic, SportsNation, ESPNFC, and more." ESPN Sports Connection will be available for the Wii U this holiday season. Though the ESPN branding might be a little heavy-handed, it could be a way to introduce non-gamers to the Wii U, much like Wii Sports did with the Wii.